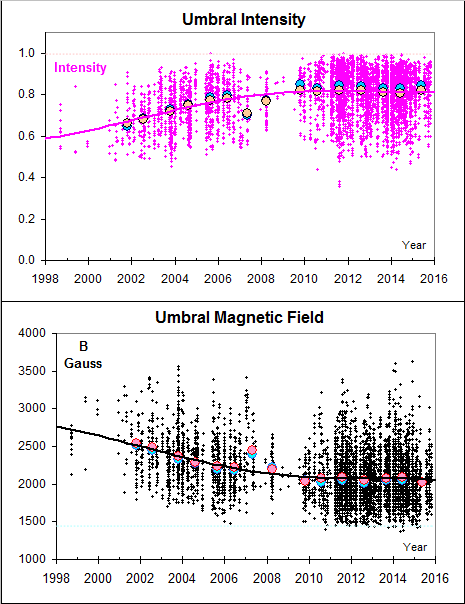 A recent paper in the Journal of Geophysical Research reports over the past 20 years there has been a steady decline in activity on the sun’s surface and interplanetary magnetic fields, indicated by a dramatic decline in the number of sunspots. Scientists and astronomers from Physical Research Laboratory in India and counterparts in China and Japan write the decline in solar activity could indicate Earth is heading for another “little ice age” or even a more extended period of low solar activity, a Maunder Minimum, by 2020. During the last Maunder Minimum, between 1645 and 1715 AD, the sun was almost completely spotless and Europe and much of Earth witnessed extremely harsh winter. According to the West without Water, the paleoclimate records show increased climate variability during the Little Ice Age in the Southwest US. It was generally cooler and wetter, punctuated by episodes of drought, sometimes severe drought lasting for several years. If low sunspots produced a cool wet climate in the Southwest, including California the past, I think we should consider the possibility it will happen again. This is in conflict with the promotion of global warming being promoted by the Governor and the environmental wackos at CARB. I wonder of some of the North Atlantic core samples would have some information on the state of the AMO during the Dalton Minimum? Could be an interesting place to look, assuming there are some core samples of the North Atlantic. Thanks for the link to the AMO. I was going post on the implication, but Vencore has an excellent review. Again, thanks for sharing this important information. The relevant chart is umbral magnetic field. I’m no expert, but the thinking as I understand it is that field strength has to exceed 1500 gauss to form a sunspot and the closer the umbral magnetic field gets to 1500 the fewer sunspots make the cut. If the Umbral Magnetic Field had dropped to 1500 gauss like some people feared, the sun would look like a “1” ball without the number. At 2000 gauss it is going to be like the current cycle and just stay very anemic from a sunspot standpoint. Unfortunately the field strength appears to have started down again. If it hits 1500 we will have a grand minimum that is both grand and minimum. We are going to have both!